The next step in Facebook’s video push occurred Thursday with the launch of Instant Video for Messenger. Here’s how it works: First make sure that both you and your friend have the latest version of Messenger for either iOS or Android. Then while both of you are viewing an open Messenger conversation, tap on the video icon in the top-right corner to start sharing real-time video. Audio is off by default because sometimes you just need to see something, not hear it—but sound can easily be turned on if you choose. Your video will float over the active text conversation that you can continue while viewing the video. Your friend can watch your video stream and share a video back if they decide. Video calling is still relatively new, and until recently, reserved for special occasions like celebrating “in person” with Grandma on her birthday or seeing Dad on a business trip. Now that we all seem to have a video camera and internet connection in our pocket, video is a regular part of everyday life—whether we’re sharing it, preserving it or chatting with it. Instant Video is a reflection of the ubiquity of video—we simply expect to have that ability in real-time, all the time. With Instant Video, you can bring your conversations to life in the most authentic way—seamlessly and instantly. It’s perfect for sharing quick moments with friends who aren’t right by your side or making your conversations richer by seeing each other face-to-face when you are messaging. Sometimes you want to ask a friend’s opinion on a pair of shoes you want to buy, weigh in on what ice cream flavor they should bring home or just want to see your BFF’s reaction to your witty message when you’re in a place where you can’t actually talk live. 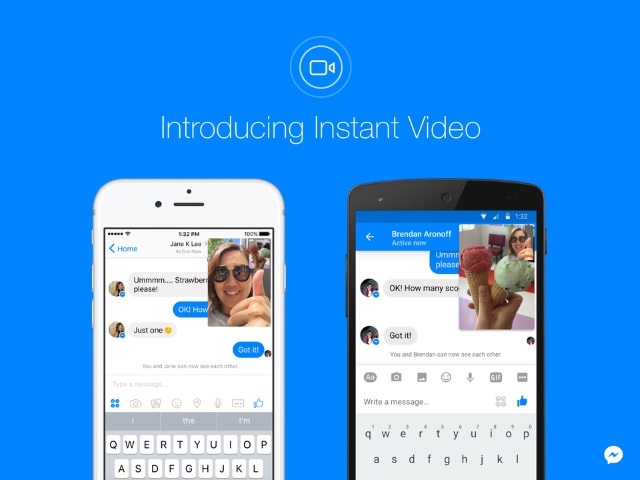 Readers: What are your thoughts on Facebook’s introduction of Instant Video for Messenger?